Hugh and Serena Hallam have made the decision to leave everything they knew in Charleston behind them, hoping to create a stable, productive home for themselves and their three children in the near-wilderness of West Tennessee. Though now war may loom on the horizon, life at Palmyra is good, for both themselves and--they believe--their slaves. Hugh is convinced that reasonable men of good will with a tolerant respect for their countrymen might yet prevail against the increasingly tense atmosphere that is dividing the two American cultures. Capable and practical, he is nevertheless considered by his neighbors to be an idealist, with progressive notions concerning the science of agriculture and the requirements of Southern commerce, an ambivalent attitude toward slavery, and a confidence about the way things should be done. But when events move their entire world toward destruction, Hugh's values are put to the test, with only his surpassing love for Serena and his belief in himself to possibly sustain him. 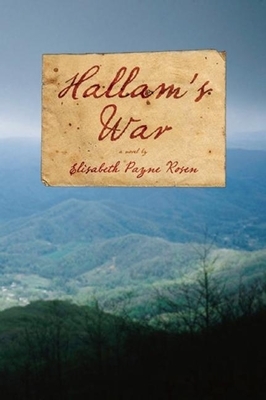 Hallam's War is the saga of one man's struggle to defend his family, his neighbors and his honor, and of the moral compromises forced upon an otherwise good man caught in a maelstrom that leaves him no acceptable choices. A man of remarkable resilience, resourcefulness and contradictions, Hugh must learn to face his own conscience with as much courage as he displays at Shiloh. Ultimately, Hugh and Serena confront the reality surrounding their relationships with their neighbors and with their slaves. If neither of them is completely transformed, each takes a step toward a new understanding. Elisabeth Payne Rosen's near-epic debut is thoughtful, authentic and carefully researched. From Nashville and Memphis to Richmond, Charleston and Washington D.C., and across the bloody battlefields of Shiloh and Bull Run, Rosen brings vividly to life a heart-rending tale that resonates with deep personal grief shot through with moments of beauty and joy. In the end, there is hope for reconciliation among us all, even in the face of all the struggles that lie ahead.